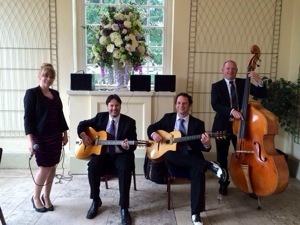 Gypsy jazz is always a popular choice for weddings, corporate events and parties across the land. Redolent of Paris in the 1920s and ’30s, gypsy jazz bands get toes tapping and tongues wagging. Gypsy swing is usually drummerless, so it’s quiet enough to chat, whilst injecting a certain frisson into the atmosphere. The Jonny Hepbir Quartet – Jonny’s quartet is immensely popular – their YouTube channel is approaching 2 million views. 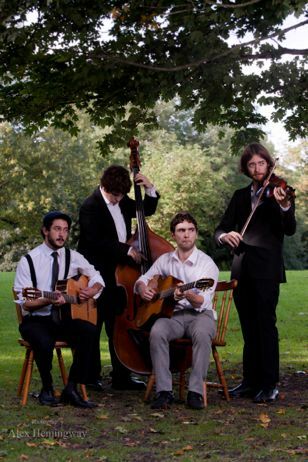 If you want gypsy jazz at your event, why not hire the best the UK has to offer? Ultraswing – this is one of the UK’s longest running gypsy swing outfits – formed in 1995 they have been playing both public and private events around the UK and further afield for 20 years and counting. The Matt Holborn Quartet – Matt’s violin-led quartet is a staple in the north of England, although they do venture down south too. A vibrant young band, they’ll get you tapping your toes. Perhaps you’ve got your heart set on gypsy jazz: if so, you won’t find better than what we have to offer. If you haven’t made up your mind, you can see other styles of jazz on our bands page. Feel free to have a rummage, and if you have questions we’re here to help. If you call or email, there’s no obligation, and we’ll always get back to you quickly. The Jazz Agency is constantly adding new bands to the books, so check back if you haven’t found something you like elsewhere.